If you went looking for some one to write a systematic or impartial account of the conflicts that are pushing America's conservative movement toward breakup, just about the last author you'd pick for the job would be Andrew Sullivan. The British-born commentator's new book, like all his work, is engaged, quirky and personal, the view of a gifted outsider who can't go for long without circling back to gay issues. 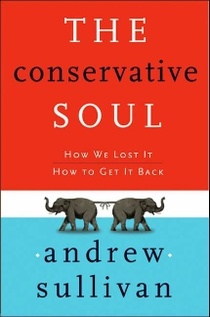 Yet "The Conservative Soul" will still resonate as one of the year's key political books, a free-associating literary polemic that well complements "The Elephant in the Room," the recent book by New York Post contributor Ryan Sager. Olson goes on to complain about my conflation of many different strands of religious certainty into a monolithic bloc called "fundamentalism." I think his criticism is a fair one, and it is a refrain among several reviewers. Here's all I'd say in response: you're right. Two defenses. The book is really a series of essays, like my last two books. It's not history as such, although it's full of history. It's not even political philosophy or theology as such although it is also saturated by both. It's an essay, i.e. an objective argument informed by subjective experience. I think it's the most honest way of writing, which is why I love Orwell's and Montaigne's and Oakeshott's essays so much. The central theme in the essay is a journey from the polarity of complete certainty to the polarity of total skepticism (and then a few steps backward). That's what I believe is the deepest tension of our time: not right and left any more, but certainty versus doubt. And so I deal with different shades of fundamentalism - and different hues and idioms and expressions of fundamentalism - all under the rubric of the total certainty that is so prevalent in the world right now. I use the Bush administration (and some of my own mistakes and life-story) as a "crucible" for such certainty. And then I try to imagine a conservatism rooted in its opposite - and make a case for why doubt itself is the real key to traditional conservatism, a doubt that leads to individual liberty, especially of conscience and thought. As I say in the prologue, this is a huge amount to deal with in around 300 pages. I have bitten off a great deal - probably far too much... It is both alarming and humbling to try and state your beliefs so baldly in one place - and everywhere I look in the text I see further complications and nuances that I want to add or subtract. But there are times when it's helpful to pull your thoughts together, set them down as clearly as you can, draw a line beneath it, and let the readers take the arguments where they want. Think of this book, then, as an opening bid in a conversation, rather than the final summation of a doctrine. You can think of this as a lame excuse for not providing The Definitive Account of What To Do Now, or an inadequate description of as vast a subject as religious faith or political thought. I think that's a fair critique. Or you can take it for what it is: just one argument - idiosyncratic, personal, but passionate and reasonable - about what conservatism can mean in the future. I am grateful to Wally for continuing the conversation. I have a feeling it's just begun in earnest.